Tree Tops at Pocono Mountain Villas in Bushkill, PA IN THE POCONOS! Tree Tops at Pocono Mountain Villas in Bushkill, Pennsylvania - IN THE POCONOS! - Bid on a 7 Night Stay in a Studio, 1 or 2 Bedroom Suite! 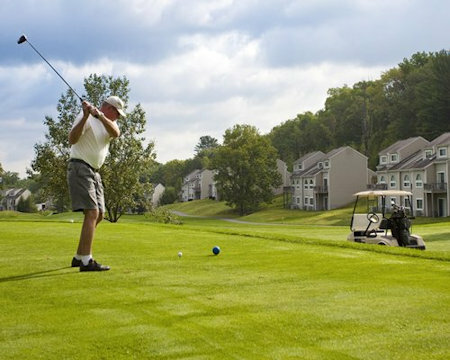 Enjoy 7 Nights at Tree Tops at Pocono Mountain Villas in Bushkill, PA - IN THE POCONOS! An escape to the mountains awaits owners who select Villas at Tree Tops as their vacation getaway. Nestled in the Poconos, these villas offer a warm and cozy escape from the everyday for your family's next vacation. No other Pocono resort provides so many extras with so much to do throughout the year. 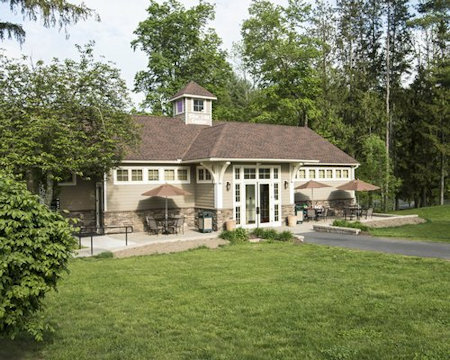 Tree Tops and Fairway Villas offer friendly service, comfortable accommodations, and a long list of amenities and area attractions. Book your family's Pocono package today! 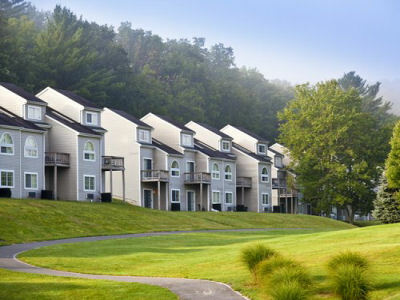 The Villas at Tree Tops is located in Bushkill, Pennsylvania. Surrounded by magnificent vistas of the golf course and waiting for you in the wooded retreat of the Pocono Mountains with many activities to choose from, including: proximity to the urban bustle of Philadelphia and New York City; the Delaware Water Gap National Recreation Area; the Crossings outlet shopping; NASCAR racing; museums; animal farms; snow tubing, and skiing. These are just a few of the options for you, making this a stimulating year-round vacation destination. 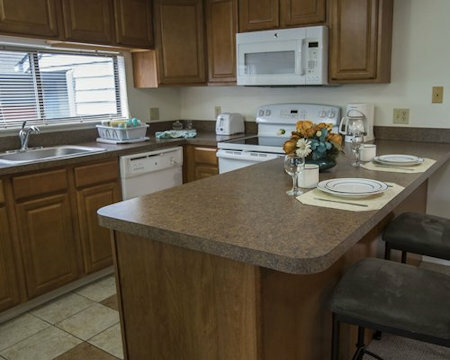 Each unit is air-conditioned and features cable TV, a washer/dryer, and a microwave oven. 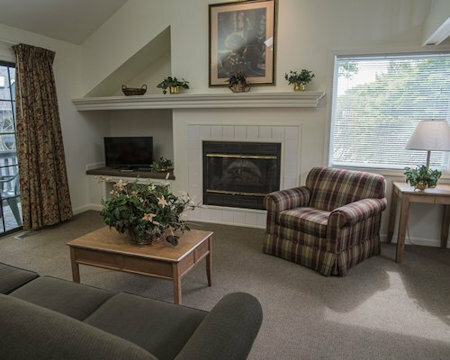 One- and two-bedroom units offer a fireplace and full kitchen. Studio Unit: Studio Unit will sleep 2-4 people and is equipped with a partial kitchen. OR UPGRADE TO A 1 BEDROOM SUITE FOR ONLY $75 FOR THE WEEK! 1 Bedroom Suite: One-bedroom units maximum occupancy is 4 and contains 1.5 baths, 1 queen bed and 1 queen sleep sofa - full kitchen. OR UPGRADE TO A 2 BEDROOM SUITE FOR ONLY $150 FOR THE WEEK! 2 Bedroom Suite: Two-bedroom units with a maximum occupancy of 6 have 2 baths, 2 queen beds, and 2 twin beds or queen sleep sofa - full kitchen. Pets are not allowed at this resort. Fees and/or deposits are charged for the use of some amenities (including skiing). A $100 deposit is required at check-in. Internet Fee is $9.95 U.S. dollars per day per device. Daily housekeeping is available for a fee. Contact the resort to verify snow tubing dates. A car is necessary to fully enjoy the area. Check-in: 4 p.m. to 10 p.m.